Add a splash of color to your entertaining space with the Pendleton Pacifica Sectional with Swivel Rocker and Fire Table by OW Lee. This set invites five to gather around the fire for a cozy evening of chatting. OW Lee has combined the intricate patterns of Pendleton fabrics with performance of Sunbrella outdoor fabrics to create a timeless style that will impress the most discerning customers. 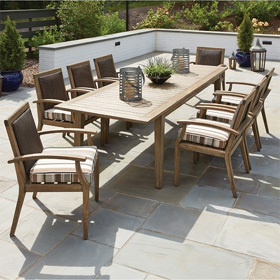 The eye catching centerpiece of this set is the Pendleton 42" Square Chat Height Fire Pit Table guaranteed to provide your gathering with reliable heat and light. This set is completed by an end table for refreshments and two pillows for added comfort. This set is made in the USA and guaranteed to resist mold, mildew, and rust. Pendleton Fabric Styles with Sunbrella Performance for Outdoors. Pendleton Fabrics are inspired by Native American Designs and Legends. Lifestyle Photo: Shown in Mill Cloth Turquois and Lahaina Wave Fabric, Coastal Grey Finish. Urban Tempo Table Top Tile. L/R Sectional 28"W x 34"D x 35.25"H 61 lbs. Corner Sectional 46"W x 46"D x 35.25 "H 110 lbs. Center Sectional 26"W x 34.75"D x 35.25"H 55 lbs. Swivel Rocker 30"W x 34"D x 35"H 77 lbs. Fire Table 42"W x 42"D x 24"H 259 lbs. Side Table 24"W x 24"D x 21"H 77 lbs. 21" Pillow 21"W x 8"D x 21"H 3.8 lbs. 19" Pillow 19"W x 8"D x 19"H 3.4 lbs.